Cocker spaniels have been treasured companions of hunters and housewives, dukes and farmhands since the 19th century. There are two primary kinds of cocker spaniels now; the English "cocker" and the American "cocker". Both are well known for having exceptionally good temperments. They are also hunting dogs that are used primarily to hunt woodcocks. 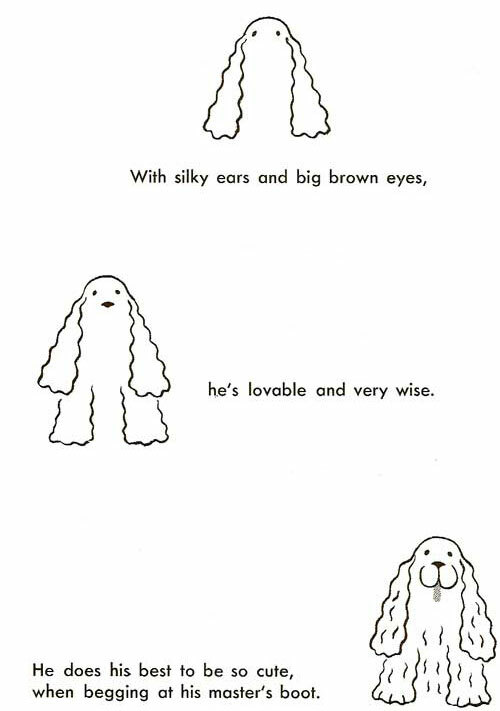 If you are starting to sense that the cocker spaniel has a very upper crust background, you are correct. Still, don't hold any grudge against these dogs for being kept by the rich. They really are wonderful dogs; gentle, smart and very obedient. Their size is also a nice balance; cockers are medium sized dogs, so they are good for apartments or small houses. Though they are hunting dogs by breeding, they do not have the exercise requirements that a border collie or a german shepherd needs, so they are better for older or more sedentary people. Cocker spaniels are something the portrait artist should learn how to draw well. Most wealthy people has at least one portrait painted of themselves, and they often want their dog nestled beside them in the pose. In fact, a portrait artist will probably get asked as least once to do a portrait of just the dog. Dog portraits are becoming quite common, and if you draw animals really well, with strict attention to detail and the ability to really recreate how a certain animal looks, you could do very well as an animal portrait artist.